There are many books to guide those of us who are caring for patients with dementia. However, there are few books that are written for the person with memory loss. As people’s ability to retain the written word declines, they tend to lose interest in books. At White Oak, we are always on the lookout for picture books that might capture the interest of our residents. However, magazines or coffee table books often fail to engage. Finally there is a book specifically written for those dealing with memory loss. It is called Blue Sky White Clouds. It consists of 26 different color photos of beautiful images in a light, easily held book. 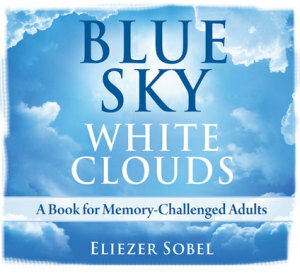 The author, Eliezer Sobel, wrote this book for his mother, who is in the late stages of Alzheimer’s disease. He realized that although she had trouble with language, she was still able to read. Therefore, the book includes very simple captions on each page on the theory that some people will enjoy the ability to read the words and associate them with the images. The photography is well-composed, devoid of extraneous details, and includes images of people, animals, and landscapes. They are likely to be familiar images to most people, and part of the magic of this book may be in its ability to suggest past, happy experiences. I brought this book to White Oak Cottages, and many of our residents have enjoyed it. My sense is that different people respond favorably to different aspects of this book. The overall reactions to the images are ones of enjoyment and laughter. Because this book’s images are so evocative, people can look at them by themselves and enjoy the pleasant associations they have with the image. Family and friends can also use it as a starting point to a conversation. If you are looking for a book for someone with memory impairment, I highly recommend this one. Next Article: What is a Clinical Trial, and Can I Participate?